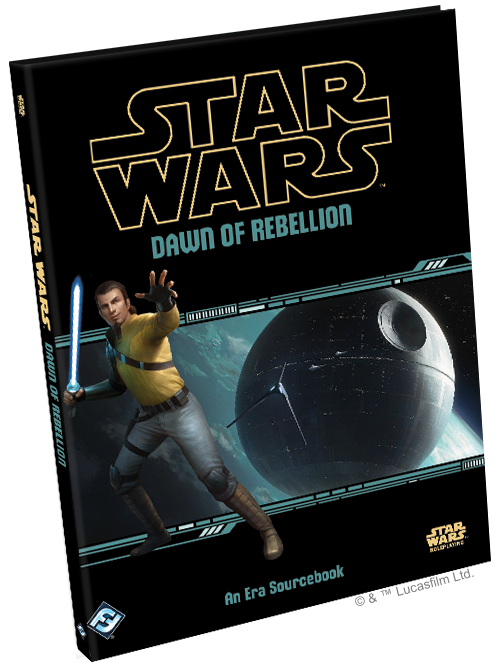 Dawn of Rebellion, the first ever sourcebook of its kind, brings you to the era of the Galactic Civil War before the events of Rogue One™ and A New Hope™, focusing on the tension, strife, and fear encouraged by the Galactic Empire at the height of its power. This is an era where despair is prevalent and the future dark, except for a few unique individuals who carry hope like a torch against the darkness, a torch that would become the spark that ultimately lights the flames of rebellion, war, and freedom. This book provides players with a wealth of new equipment, specializations, and races to paint this vibrant and dangerous galaxy in stark and stunning detail. But where Dawn of Rebellion truly shines as an era sourcebook is in its service of setting the stage for encounters, sessions, and entire campaigns in a time when the Empire is at its strongest. That is not to mean every campaign that makes use of this book will have the fall of the Emperor as its goal; instead, we can see how Star Wars™: Edge of the Empire, Star Wars™: Age of Rebellion, and Star Wars™: Force and Destiny might approach the same story element from unique angles, and how Game Masters can present these angles to their players. As an example, let’s use one of the independent organizations described in Dawn of Rebellion, the Broken Horn Syndicate. 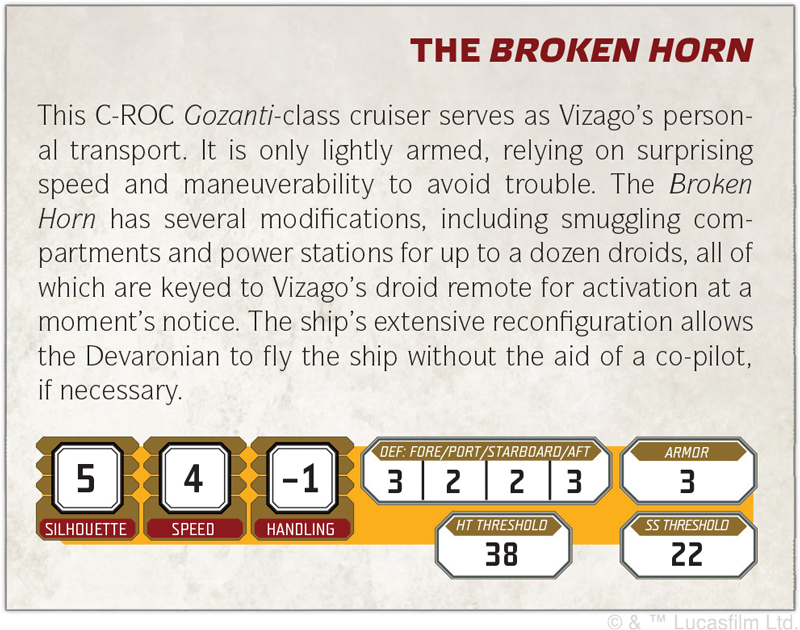 Employing loyal droids as labor and security, Cikatro Vizago built his Broken Horn Syndicate arms smuggling trade from the legitimate Twin Horns Storage shipping company after violently wresting control away from its former owners. Vizago’s base of operations is on Lothal, from which he directs the acquisition, smuggling, and sale of weapons and armor by the cargo load across the Outer Rim. Imperial presence increases both his supply and demand of weapons, as there is now a reliable source of arms to steal from and a dependable horde of fringers who would prefer to meet any opposition by the Empire with force. In an Edge of the Empire campaign, Vizago may run the spectrum between ally or antagonist as his mercurial nature follows his pursuit of credits—his one true loyalty. The PCs may begin their epic story as hired hands, making deliveries and negotiating sales to other criminal enterprises of ill-repute along the Outer Rim. Conversely, the party may find the Broken Horn Syndicate to be the target of the campaign. A previous customer may feel that Vizago has cheated them one too many times with increased prices or substandard goods and the PCs have picked up the bounty on his head. Alternatively, they might have heard of a legendarily lucrative haul aboard The Broken Horn, Vizago’s Gozanti-class transport and flagship. A Rebel cell operating in an Age of Rebellion campaign may be directed to eliminate Vizago’s operation as his hostile activity around Lothal and the Outer Rim in general has increased the Imperial attention paid to freighters and smugglers in the area. However, the Syndicate's operation could prove beneficial, as a steady supply of armament keeps blasters in the hands of those willing to wield them, and Vizago's intelligence network could prove invaluable in avoiding Imperial customs or locating vulnerable supply caches. Finding common cause with a notorious criminal (or eliminating his enterprise) should make for some very exciting roleplaying scenarios with a party whose members may have differing views on the ethics of such potential corruption. The stat block for Cikatro Vizago presents a sly adversary. Characters in Force and Destiny might be less likely to see Vizago as an asset or ally unless they lean more towards the dark side, but how they interact with the Broken Horn Syndicate could still go in many different directions. A group may see him as a direct threat to the lives and well-being of the citizens of the Outer Rim, as his brutal and feckless demeanor leaves pain and suffering in his wake. In this story, Vizago’s criminal enterprise is the antagonist of an entire arc or campaign. However, in a different style of game, he may only make an appearance for a session or two as a group of Force-sensitive fugitives from the Empire make use of his ship as transport—either as paying passengers (at an exorbitant rate) or stowaways. Vizago’s extensive use of droids puts the players at a disadvantage, as many of their powers that affect the mind or perception simply do not work on his mechanical employees. Because of this, even remaining hidden and alive poses new challenges. In addition to extensive information on the Broken Horn Syndicate, Dawn of Rebellion comes packed with descriptions, statistics, and adventure hooks for many notable Star Wars organizations. The Empire’s Inquisitorius, the Rebellion’s Phoenix Cell, and the Free Ryloth Movement are just some of the groups represented to add friends and enemies to your campaigns. How will you utilize the wealth of content in Dawn of Rebellion? Pursue the mysteries of the Force by traveling to forgotten worlds in an abandoned and refurbished U-Wing. Work alongside mysterious Fulcrum agents to protect a fledgling Rebellion. Make a fortune flying dangerous routes through Imperial space to fulfill the contract of a lifetime. The galaxy rests of the edge of a vibroblade and its waiting for you to make your mark. Dawn of Rebellion (SWR10) takes you to a galaxy on the brink of war in the first quarter of 2018! Pre-order your copy at your local retailer or online through our website today! Journey into the Star Wars galaxy with Star Wars Roleplaying—split across three distinct books, each focusing on a different aspect of the galaxy. You may join the smugglers and bounty hunters of Edge of the Empire, join up with the Alliance in Age of Rebellion, or learn the ways of the Force in Force and Destiny.